It’s rather been a whirlwind and adjustment period for me. Getting used to working again .. and not just 8 hrs a day – but for 9 hrs (minus ½ hr lunch). 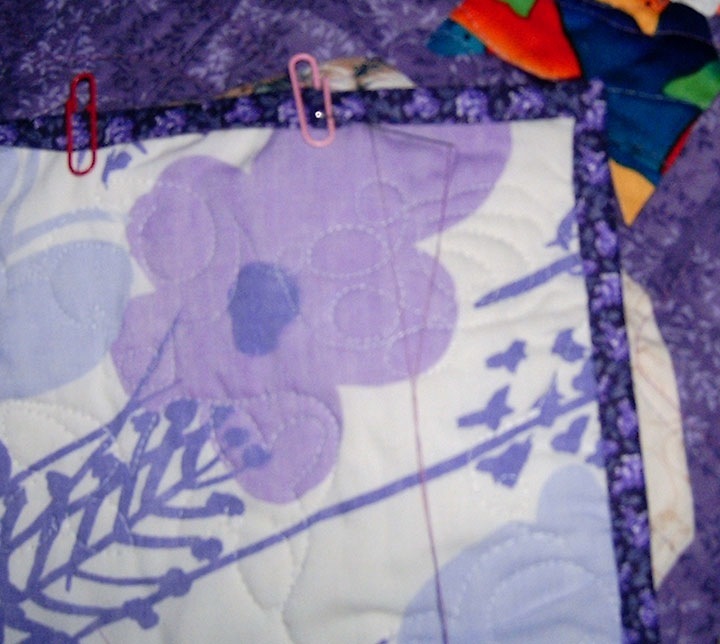 Doing the 4pm – 1am shift wasn’t to bad for me .. it seemed that I still got some ME time and quilting time. I’ve just finished my first week of my new shift – 12noon – 9pm. While you’d think that that was a great shift (and it is), there’s a period of adjustment to it for me .. For 2 years, I’ve basically gotten up when I wanted and slept when I wanted .. Doing the first shift of 4 – 1 wasn’t to bad, as I didn’t go to bed until 4am anyways .. I’d get up around 11 or so and have plenty of ME time and time before work to do whatever .. My body still is sort of awake at 3:30 – 4am right now, but I can’t really get up at 11 and expect to have enough coffee in me before I leave at 11:30 for 12 noon start time .. just leaves me feeling rushed and harassed. Ultimately my goal is to be up around 8 – 9am, so I can have those few hours to do whatever I want .. I’m still working on that 😀 But it is getting better .. It’s not a lot of time, but then again, I KNEW I wouldn’t have that time anyways – hence the quilting marathon I did in February and March. During the past weeks, I’ve taken the time to watch tv with Reg and I’ve gotten a few bindings done .. you know I’ve done the spinner quilt, and the other day I finished the big fan quilt .. It’s not been washed yet, but that’s tomorrow’s task. Here’s a quick peek of it with the binding sewn down tonite. 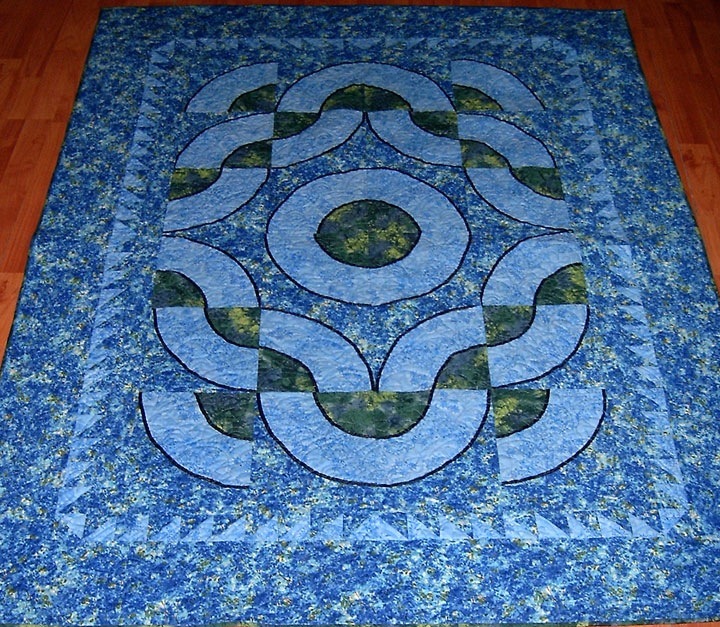 I’m hoping to get some daylight pics of this and the spinner quilt since the weather is going (I pray) to be sunny! It is a wonderful feeling to get these quilts crossed off my list! I’ve not labeled this one as yet, and am not entirely sure what I’m going to call this one. This was the NYD mystery hosted on Planet Patchwork – and this was also the same day that I found out my aunt had been killed in car crash on her way to her bday dinner with friends the nite before … I’d like to dedicate this to her, but am still struggling with the name. This has become my favourite quilt. I love the way it quilted up, has a nice feel to it (even if it does weigh more than normal) – it’s just nice and peaceful .. I’m sure a name will come to me in time. But I can always do a label with the dates on it for now and add the name later. My next project is the binding on the kitty quilt .. sorry for the blechy pic, but this is just to give you and idea of what I’m doing. But work is going well, I’ve not lost any customers (that I’m aware of), altho one customer with a thick heavy accent asked me if I spoke english 😐 .. I was absolutely rendered speechless, and that’s not something that happens to me often .. he ended up in the wrong department and was not wiling to answer my questions about best to direct his call .. **sigh it IS rather laughable tho .. anywho, the job isn’t boring, it is almost more challenging than I would like in one day out of every 3, but I do like it well enough .. would I rather be quilting?? you betcha .. but that just makes the time I do grab for it all that more precious to me ..
Nice to see you’re still around. I’ve missed reading your stuff and was beginning to think you’d gotten sick on top of working. Hang in there; you WILL adjust and find the time to do what you truly love. That would be tough for me too — going back to having set hours. I do have to adjust my schedule when I travel but for the most part I allow myself to sleep when I need to (usually late in the mornings since I tend not to sleep so well at night). I thought I was catching up on bindings too until I realized that with the 4 tops I have finished recently I’m back up to 6 waiting for binding…sometimes I think I just move things from one *to do* pile to another! That is so beautiful, Grace! It reminds me of the peacefulness of the ocean, kind of like a window into another world. One day, I will do one of these, but like u I am finishing things I have already started for the present! Can you add me to Facebook, please. See you over there too.